When you live in the Florida heat and humidity like I do, one thing is fairly certain — you’re gonna sweat. And if you’re me, you’re gonna sweat a lot. I mean, I’m a sweaty gal by nature, and I kind of exercise a lot, so, yeah. My skin — and my workout wardrobe — takes a serious beating. For some reason, this summer more than any other, that beating has resulted in some unpleasant acne and pretty rank workout clothes. Happily, after only a few weeks of whining about it, the universe (or a few helpful PR folks — same diff) presented me with several solutions good enough to share for Be-YOU-tiful Week. Wisk Deep Clean Power Blasts are designed to clean beyond visible stains, which is good because the stuff making my clothes smell was not the kind of ickiness visible to the naked eye. I’ve always used liquid laundry detergent, but I have to say I immediately liked the little detergent pods. The instructions said I could use one for a small or lightly soiled load, or two for large or seriously gross (my words, not theirs) loads. I basically always use two. So far, I’ve noticed a difference. Some of the clothes that were, you know, terrible, well, they might be beyond help, but the items that were moderately awful (and items that didn’t smell yet but that I wore for workouts)? They’ve been awesome. Not stinky, but also not overpowered by a detergent smell. It’s worth noting, however, that I’ve also made a habit of trying to wash smaller loads of workout clothes more often so that I don’t have piles of wet, sweaty clothes sitting around for several days, which might be helping as well. I came across some ZAPZYT products many years ago while out of town with a friend. I had a zit coming on that I knew was going to be a ridiculous, huge, painful one, and figured I would just ride it out. She had a small tube of some sort of ZAPZYT cream on hand and let me use it, and, what do you know? The zit never fully reared its ugly head. So, when I got an email offering me some ZAPZYT products to try, I replied YESSS!!! as quickly as I could. 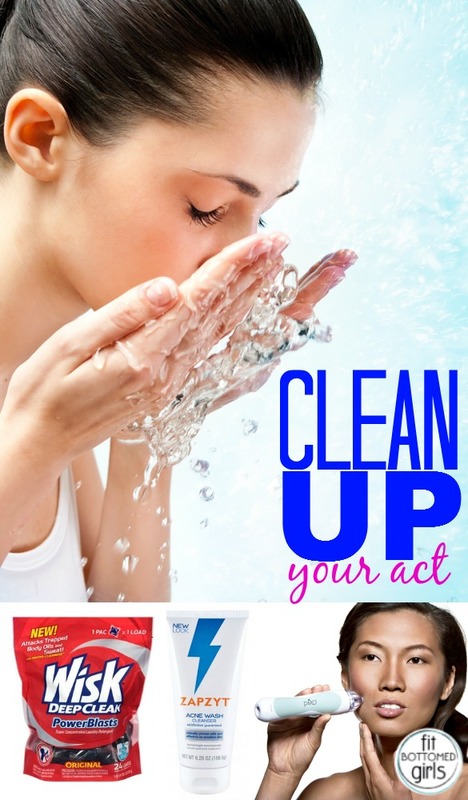 They sent along an Acne Wash Cleanser and Pore Clearing Scrub, which can be used on the face or the entire body, as well as a Pore Treatment Gel with salicylic acid and an Acne Treatment Gel with benzoyl peroxide, both of which are great for on-the-spot treatments. All three products are alcohol-free, dye-free and fragrance-free to avoid skin irritation, and are totally affordable, ranging from $4 to $9. I’ve been using the products regularly for a couple of weeks now, and the acne on my face — my chin especially — is flat out gone. The acne on my chest and back seems to be a bit more stubborn, but I’m also not as consistent about washing that with the proper products morning and night, so I think that’s probably user error. Bottom line: I’m really glad I got my hands on this stuff. The results are fantastic, and I’ve had no negative side effects. Now, it’s time to bring out the big dog. PMD (which stands for personal microderm) is a current darling of beauty vloggers. The before and after shots on the website feature a lot of improvement with acne, which is, of course, awesome, but it’s also been proven effective at reducing signs of aging, like wrinkles, age spots and sun damage, and while acne has been a recent issue for me, the rest of the list has begun popping up more and more, so I was totally game to give something new a shot. The how-to video gives clear, easy-to-follow instructions, and the tool itself is far easier to use than I expected. You simply choose the right disc (starting with the white training disc and moving up to more abrasive options — which are included — as needed; there are also larger discs included for use on the body), plug it in, turn it on, and move the PMD along your skin in smooth, even strokes. It feels a little weird, I’ll admit, but not at all painful or unpleasant. And I found that I was able to treat my whole face in 5 to 10 minutes, max. I haven’t used it long enough to notice a huge change — you only use it once a week or so — but I’m very excited to see the results after a few more uses. The PMD comes in a variety of colors and costs $159 (U.S. and Canada — add $22 for international purchases), and they also offer a line of skincare products to go with it, with a starter kit costing $39.95 and a full kit coming in at $79.95. Are you planning on doing a follow-up on the PMD after you have done a few more sessions with it? I am very curious if you find that you see a difference after a month or so of use. Thanks! Hey Sherri! Yes, I think I will — maybe I’ll shoot a quick video about it. Keep an eye out! I am sure that no one like acne on his or her face. These exercise good to prevent from acne problem. You can use best antibacterial bar soap that has best results for acne problems.